The Visor is one of the most useful pieces of technology ever created. It also has one of the worst speakers. 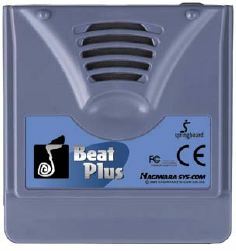 Hagiwara Sys-Com has alleviated that problem with the Beat Plus Springboard module, which gives your Visor full audio effects. First, the techno babble: The Beat Plus utilizes a Yamaha LSI tone generator to provide an FM Synthesizer with 16 simultaneous tones and an ADPCM decoder that can handle sampling rates of 4kHz and 8kHz. I've heard that this is essentially the same quality sound as the original Sound Blaster (ah memories). The Beat Plus uses a mono speaker but has a stereo headphone jack (headphones not included). Optimized full versions of Zap!2000/Zap!2016 are included. Although the module is slightly thicker than a standard size module, there should be no problems with any cases you may own. Games on the Visor will never again be the same. I played Zap!2016 on my Visor Prism and was very happy with the sound output it produced. Every shot, crash, and explosion sounded great on the built-in speaker, and even better with the headphones, although I wish Zap would have utilized directional sound. Although there was no in-game music, a nice opening and closing crescendo could be heard when playing Zap. 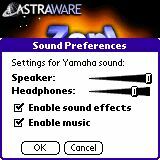 Notice from the screenshot that there are separate volume settings for the speaker and headphones. There is one application, BeatPlus, that resides on the Visor when the module is inserted. Its sole purpose is an information screen with the ROM version of the module. There is a warning to exit the application before removing the module. Be sure to heed this warning, as I had a hard reset as a result of not exiting a Beat Plus application properly. Just as with other modules, you should always run another program before removing the Beat Plus.